The hospital has already introduced an integration-system (telemedicine-System) for one of their ORs. The system is able to display all used camera-sources (endoscopy, microscopy, vital-signs, OR-light camera) at the monitors inside the OR, transmit the signal to the lecture hall (video conferencing) and record still-images and videos from the used camera-sources. Unfortunately the system is not able to import the scheduled patient-data and is not able to export the recorded media to the central image management system (PACS), due to incompatible software-interfaces. For an optimal workflow, the hospital is looking for a solution, which enables the integration-system to import the scheduled patient data and export the recorded media to the central PACS. 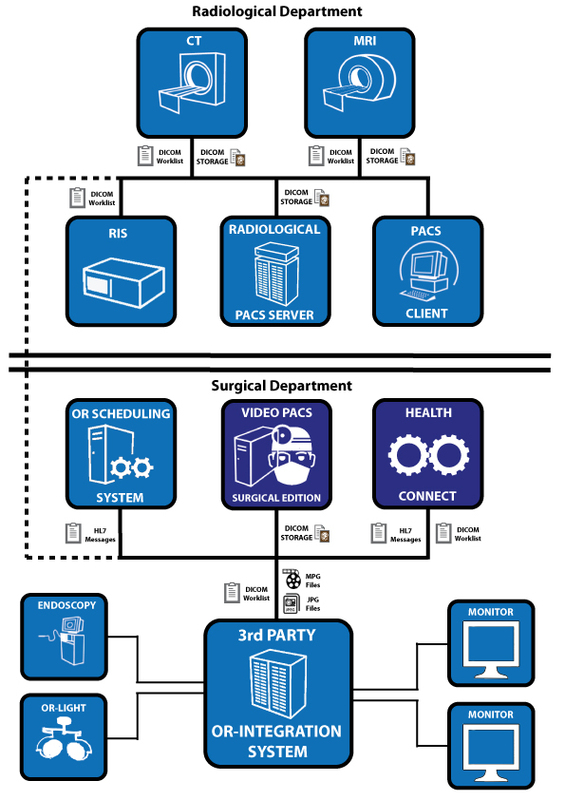 HCI is offering a "DICOM middleware" Health Network-Connect which will be installed "between" the hospital's IT-infrastructure and the existing integration system. Health-Network Connect is a customizable software-interface which is able to receive the patient-data from the HIS or RIS and translate the data for the integration system.